Airship 27 Production is thrilled to announce the release of its third Brother Bones title, BROTHER BONES – TAPESTRY OF BLOOD by Ron Fortier. Located on the Northwest Coast, Cape Noire is a booming economic giant whose inner core has been corrupted by all manner of evil. From the sadistic mob bosses who ruthlessly control vast criminal empires to the fiendish creatures that haunt its maze of back alleys, Cape Noire is a modern Babylon of sin and depravity. Amidst this den of iniquity strides a macabre warrior committed to avenging the innocent and holding back the tide of villainy. He is Brother Bones, the Undead Avenger and there is no other like him. A one time, heartless killer, he is now the spirit of vengeance trapped in an undying body. He is the unrelenting sword of justice as meted about by his twin .45 automatics. His face, hidden forever behind an ivory white skull mask, is the entrance to madness for those unfortunate enough to behold it. This new collection features five suspenseful, fast pace action-action packed stories featuring pulp fiction’s most original hero, Brother Bones. This highly popular Undead Avenger was introduced in a short story collection and the last year appeared in his first ever full-length novel. 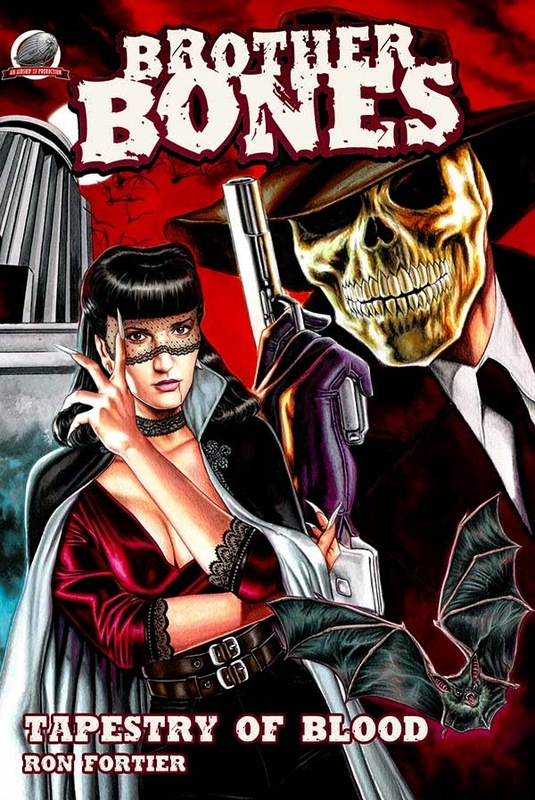 “Bones seems to have struck a chord with our readers,” states Fortier, a two time Pulp Factory Award winner and Airship 27 Production’s Managing Editor. “Every time we release a new book, they immediately start asking for more. As Brother Bones’ creator, that is truly gratifying.” Now Fortier picks up the saga once again exploring the mysteries of Cape Noire alongside its most arcane defender. The book features twelve black and white interior illustrations by Airship 27 Art Director, Rob Davis, another Pulp Factory Award winner, and a dazzling cover painting by Pat Carbajal. Time to draw the shades, light the candles and enter into a TAPESTRY OF BLOOD! 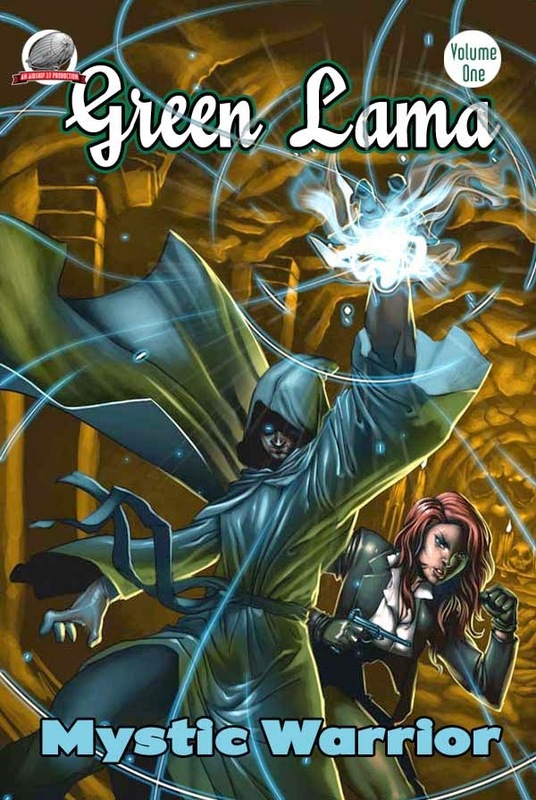 Airship 27 Productions turns its focus once more on a classic pulp hero, the Green Lama, Mystic Warrior. Jethro Dumont was a jaded, rich American who hungered to find purpose in this world. His search for self-knowledge and fulfillment led him to a secluded Buddhist monastery high in the Tibetan Himalayas. There Dumont studied the mysteries of the orient at the same time learning to accept the non-violent tenets of this ancient and venerated philosophy. By the time he returned to America, he was a changed man; one possessed with mental clarity and unique, mystic abilities beyond the understanding of normal men. Now, with the aid of his Buddhist companion, Tsarong, he assumes the identity of a new, eerie crime-fighter, The Green Lama! For years the exploits of Green Lama have thrilled pulp fans both in his own magazine, in comics and on radio. Now he returns to pulp action in this collection featuring two previous issued classics by Peter Miller and Kevin Noel Olson and two brand new, never before printed adventures by Nick Ahlhelm and Robert Craig. From confronting Nazis in his beloved Tibet to investigating bizarre murders in a Hollywood movie studio, Jethro Dumont’s new career is one filled with plenty of action and adventure as the Mystic Warrior strikes again!